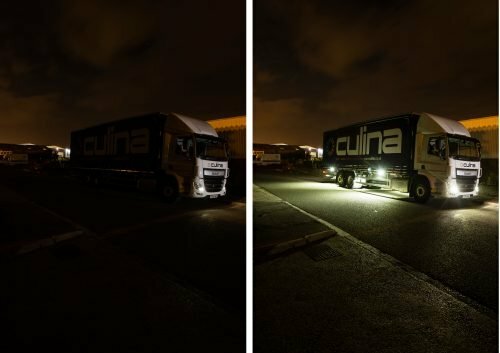 Culina Group, the market-leading food & drink warehousing, distribution and transport specialists, are specifying Labcraft’s Banksman system to improve visibility and maintain safety during night time vehicle operations. From a national network of approximately 60 depots, Culina Group operate over 1000 vehicles, including around 2,000 trailers and delivers annually to over 4,500 destinations. To assist in this regard, the Labcraft Banksman uses high-intensity LEDs to project a white light at a specified angle from the vehicle sides onto the surrounding area and illuminates the area where traditional reversing lights cannot cover. Positioned in two places on each side of the chassis, the system comes on automatically when reverse gear is engaged. In addition to its success so far with Culina Group, Labcraft’s Banksman manoeuvring light system is already proving to be an effective contributor to safety and cost reduction across numerous commercial vehicle industry sectors. To date, over 5,000 systems have been installed. Culina Group provide approximately 8 million sq. ft. of chilled and ambient warehousing space to support a wide range of bespoke logistics solutions across the UK and Ireland. Over 6,500 people are employed across the network.